We have created our first MVC 5 application in the previous section. 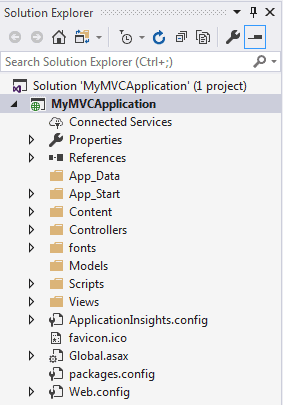 Visual Studio creates the following folder structure for MVC application by default. Let's see significance of each folder. App_Data folder can contain application data files like LocalDB, .mdf files, xml files and other data related files. IIS will never serve files from App_Data folder. App_Start folder can contain class files which will be executed when the application starts. Typically, these would be config files like AuthConfig.cs, BundleConfig.cs, FilterConfig.cs, RouteConfig.cs etc. 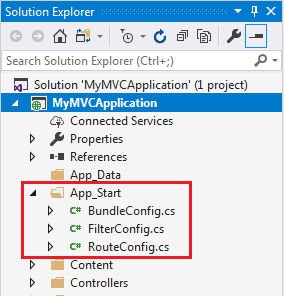 MVC 5 includes BundleConfig.cs, FilterConfig.cs and RouteConfig.cs by default. We will see significance of these files later. Content folder contains static files like css files, images and icons files. 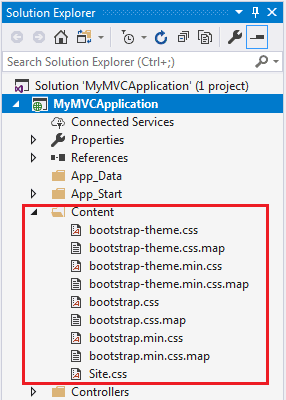 MVC 5 application includes bootstrap.css, bootstrap.min.css and Site.css by default. Controllers folder contains class files for the controllers. Controllers handles users' request and returns a response. 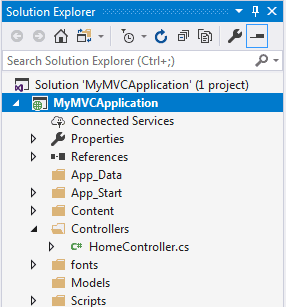 MVC requires the name of all controller files to end with "Controller". You will learn about the controller in the next section. Fonts folder contains custom font files for your application. Models folder contains model class files. Typically model class includes public properties, which will be used by application to hold and manipulate application data. 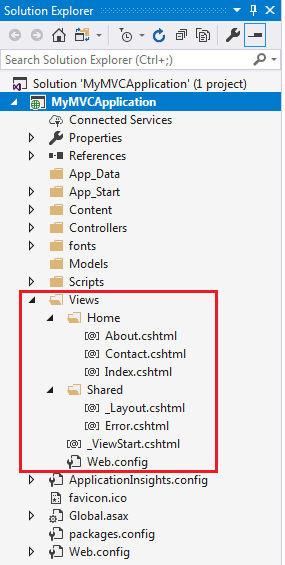 Views folder contains html files for the application. 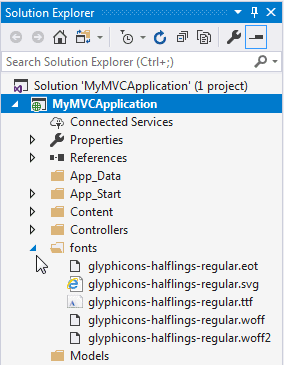 Typically view file is a .cshtml file where you write html and C# or VB.NET code. Views folder includes separate folder for each controllers. For example, all the .cshtml files, which will be rendered by HomeController will be in View > Home folder. Shared folder under View folder contains all the views which will be shared among different controllers e.g. layout files. Global.asax allows you to write code that runs in response to application level events, such as Application_BeginRequest, application_start, application_error, session_start, session_end etc. Packages.config file is managed by NuGet to keep track of what packages and versions you have installed in the application. Web.config file contains application level configurations. Learn how MVC framework handles request using routing in the next section.